“Bust Alexander Severus Louvre Ma1051 n1” by © Marie-Lan Nguyen / Wikimedia Commons. Licensed under CC BY 2.5 via Wikimedia Commons. 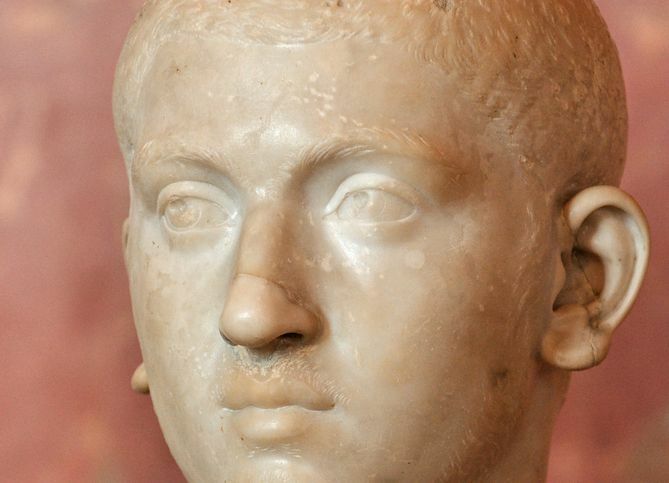 Severus Alexander was Roman Emperor from AD 222 to 235. The earlier part of Alexander’s reign was benign as he inherited a prosperous empire, but the end of his rule was marked by the Crisis of the Third Century, which brought half a century of civil strife, foreign wars, and collapse of the economy. Alexander was young, immature, and inexperienced boy when he ascended the throne, he knew little about government and the role of ruling over an empire. Because of this, throughout his entire reign he was a puppet of his family’s bad advice and entirely under their jurisdiction, a prospect that was not popular among the people and the soldiers. Toward the end of his reign the empire faced hyperinflation caused by years of coinage devaluation. He enlarged the army by one quarter and doubled the soldiers’ base pay. He needed ways to raise money quickly to pay the military’s “accession bonus” and the easiest way to do so was by inflating the coinage severely, a process made possible by debasing it with bronze and copper. This had the predictable effect of causing runaway rises in prices, and by the end of the third century the old coinage of the Roman Empire had nearly collapsed, and trade was carried out through barter. This resulted in the disruption and the eventual collapse of the extensive internal trade.